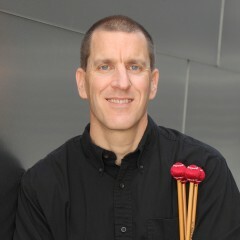 Percussionist Jim Babor has been a member of the Los Angeles Philharmonic since 1993. In addition to his performances with the Los Angeles Philharmonic, Babor regularly plays contemporary repretorie in the Philharmonic’s Green Umbrella series. Previous engagements include the Cleveland Orchestra, the Toronto Symphony, the Seattle Symphony, the Kansas City Symphony, and the New World Symphony. He has also been fortunate to work with the New York City-based quartet So Percussion. Solo highlights include performing the xylorimba solo in Oliver Messiaen’s Des Canyons Aux Etoles under the baton of Esa Pekka Salonen with the Los Angeles Philharmonic and again with Gustavo Dudamel conducting during the Philharmonic’s 2016 European tour. Babor was the featured soloist in Jennifer Higdon’s Percussion Concerto during the 2016 season of Visions and Voices in Los Angeles. His work can be found on Deutsche Grammophon, Sony, Telarc, Teldec, and London Records. Babor has given master classes at numerous institutions throughout the United States and Canada, including the New England Conservatory, Boston College, the University of Miami, the Royal Conservatory, and the San Francisco Conservatory. He has also given clinics at the Annual Percussive Arts International Convention sponsored by the Percussive Arts Society. Babor is a Remo Orchestral Artist and an endorser of Pearl/Adams Percussion, Sabian Cymbals, and Freer Percussion Products. Babor received his B.M. degree from Texas A&M University and his M.M. from the Cleveland Institute of Music and has studied with Richard Weiner, Paul Yancich, Cloyd Duff, and Doug Howard. He is currently on the faculty of the Thornton School of Music at the University of Southern California. Babor’s interests include volunteer work at Ghostnet removal and Project Baseline conservation initiatives. He is an accomplished Technical and Cave Diver, with Global Underwater Explorers for Cave Diver 2 and Rebreather Diver certifications.